Day 223–A Freezer and How Much Do We Really Eat? Oh! I like this version!! My kids actually love eggplant parm, but it’s because I fry it up nice and crisp. Like okra. You can’t go wrong with fried okra. Anyway… this sounds awesome!! I might add a few panko breadcrumbs to the top before i bake. It’s a texture thing. I like some crunch. Ya think that would work? We are loving our roasted tomato sauce 🙂 Deee-lishus. This looks fantastic! Can’t wait to try it. 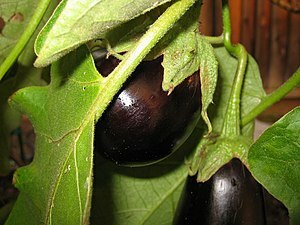 Looks delicious – I made baba ganoush with my eggplants yesterday. Yummy! I’m going to try that this week! Did you grill your eggplant? No we just roasted it in the oven for about an hour until it collapsed. Then we blended it up with tahini and garlic and olive oil. Yum.